The Les Voiles de St Tropez regatta, enjoying the last of the warm-water Mediterranean racing, takes place off in the waters off St Tropez, France, this week 28 September to 6 October 2013. The regatta has been held every year since 1981 as ‘La Nioulargue’, and gathers together the most extraordinary modern sailing boats alongside the most beautiful classic superyachts. During this annual event, a host of racers and sailing enthusiasts come from all the corners of the globe to do battle in the bay of Saint-Tropez, once a peaceful fishing village and now a very appealing playground for international socialites and celebrities. Yachts hitting the water in 2013 will include classics such as Partridge (1885), Marigold (1892) and Sif (1894). 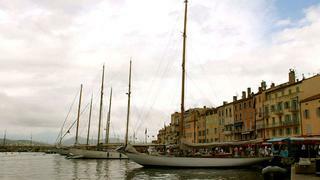 Four J-Class Yachts have signed on for this edition of Les Voiles de Saint Tropez, including Hanuman, Lionheart, Velsheda and Shamrock V.
There are new additions to the Modern fleet, such as thirteen Wally yachts, including a much-anticipated duel to test the WallyCento class with the newest, Magic Carpet3, facing off against her predecessor Hamilton. Also in the Modern class will be the first Tempus 90, the newly launched sailing yacht Tempus Fugit, which is the latest creation from British architect Rob Humphreys, and also the Maxi Dolphin FC100 Nomade IV. New this year, Thursday will be Challenges Day. Skippers and yachtsmen challenge themselves at will, against yachts not necessarily from the same class, on a special ‘no-stakes’ course. Racing starts Monday, stay tuned for more updates.